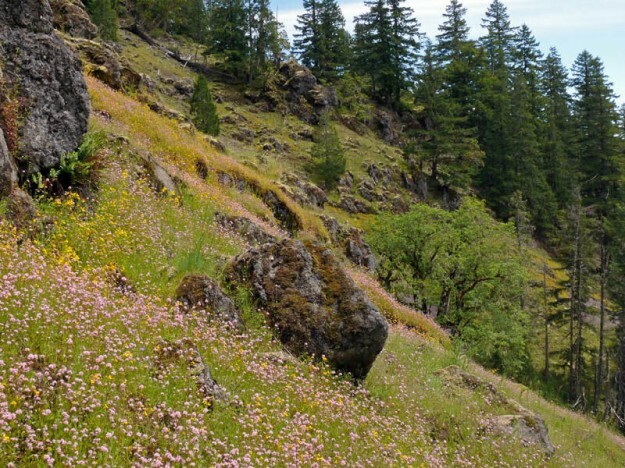 Several years ago, Sabine and I discovered a great roadside area for botanizing along Deer Creek Road in Linn County. Head out the McKenzie Highway past the ranger station. Deer Creek Road heads off to the left (west) after about 7.5 miles (3 miles south of Trail Bridge Reservoir). While you’ll start to see nice patches of Cryptantha intermedia pretty soon along the road banks, the real show doesn’t start until you drive past Fritz Creek. Here, between about 2.5 and 4 miles from the start of the road, there are about 13 creeks and seeps spilling down onto the road bank and fueling an amazing show of annuals this year. We hadn’t explored the area since 2005, so after a quick trip up Castle Rock a couple of weeks ago, we decided it would be worth checking out. The blue sheets of Collinsia grandiflora were outstanding. Mimulus guttatus was also quite lovely, and many other plants were still going strong—even some Romanzoffia thompsonii I remembered seeing on our original trips. At one particular small creek, I had discovered some Dodecatheon pulchellum back in 2005. At only about 2500′ elevation, it is the lowest site for this variety I know, and I figured it would be finished, but I still wanted to relocate it, and was pleased to find 3 small plants in the creek bed. 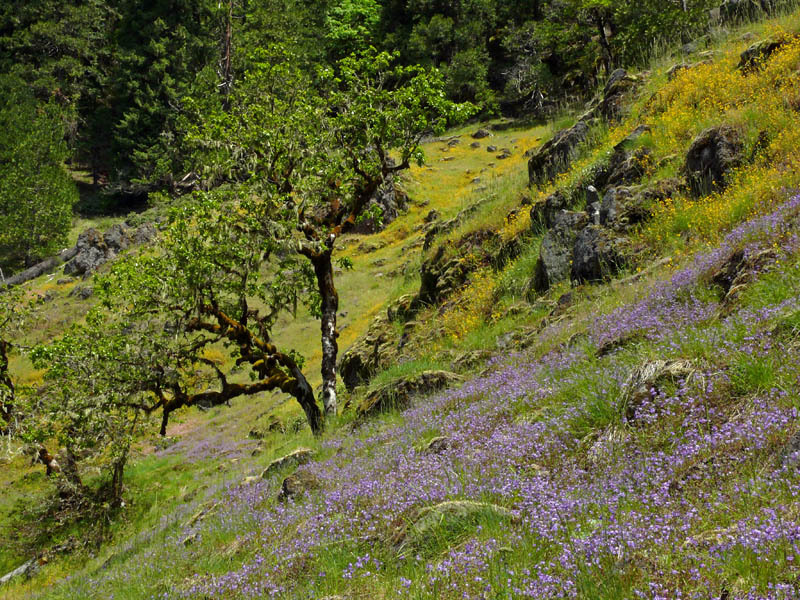 I remembered finding much more in a somewhat hidden seepy meadow farther up hill. There are several other meadows above these roadcuts I hadn’t investigated yet. Clearly this area was worth a whole day of exploring. When the forecasted weather didn’t look like it wasn’t going to stay nice enough for an overnight trip, and the low clouds might make it unpleasant at higher elevations, I figured it was the perfect time to head back to Deer Creek. So last Friday (June 18), Sabine and I headed east right out of the clouds and into a sunny day. 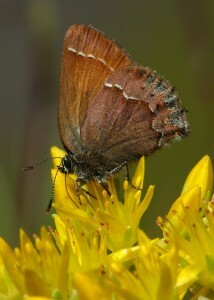 The flowers were still going strong along the road banks, but it was the meadows above we really wanted to see. With our Google Earth aerial photo in hand, we decided to park at about 2.9 miles from the highway where there was a spot that came down low enough for us to climb up a couple of hundred feet to the biggest meadow. Much of the road bank is far too steep to climb. Without too much trouble, we made our way up through a short stretch of woods before coming out into a large, stunningly beautiful, sloping meadow with picturesque rock outcrops and clumps of oaks. For anyone who has been to Tire Mountain at its peak (probably also about now, but I have not made it there this year), this rivaled it at its best. I’ve found the cold, damp weather we’ve had all spring rather depressing, but the seep-loving flowers are adoring it. There was even a little Crocidium multicaule still in bloom by the road—almost 4 months after I first saw it at a similar elevation—proof that the annuals will keep blooming as long as they still have enough water. Up in this large meadow, there were a number of big splashes of blue Collinsia, yellow Mimulus, and pink Plectritis congesta—like someone had spilled buckets of paint on the hillside. Tons of other small annuals were also in bloom including 3 species of annual clovers, Cryptantha intermedia, a small-flowered Plagiobothrys (still can’t figure those out), Daucus pusillus, Githopsis specularioides, Leptosiphon (Linanthus) bicolor, and Madia exigua. There were some lovely patches of perennials as well including Lupinus arbustus, Eriogonum compositum, and one drier area with blooming death camas. Many more plants including Dichelostemma congestum and Triteleia hyacinthina and loads of Clarkia were still in bud, making it well worth a return trip. After soaking in the beauty of the sunshine, flowers, and scenery, we headed back down and drove a quarter of a mile farther to an old quarry. From there we hiked uphill again to a smaller meadow. This one had pretty much the same suite of plants plus quite a bit of Phacelia hastata in the rocks. That’s a species I don’t see very often and was surprised to find it at this elevation rather than the common Phacelia heterophylla that forms statuesque inflorescences on Tire Mountain and similar south-facing meadows at my favorite haunts in Lane County. Suddenly there were lots of Microseris nutans in bloom. Presumably it had been closed in the morning as we had noticed some leaves but no flowers in the first spot. On the other hand, the many little Agoseris heterophylla that were all open before noon were closed up now. I suspect they were reacting to the time of day, but it might have been because of the clouds. By this time, the sun had disappeared, the wind had picked up, and it was getting chilly, so we didn’t spend too much time here. The last meadow was the one where I had originally found the Dodecatheon pulchellum. This was even wetter than the other two, with the same sweeps of color. Unfortunately, I couldn’t find any more Dodecatheon pulchellum, just the same 3 plants in the creek I’d found on the earlier trip. One new plant was the common Ranunculus occidentalis. Why it wasn’t in the other meadows, I don’t know. It is often interesting to note which plants aren’t evident in a particular spot. There was not a single perennial Castilleja to be found although the less conspicuous annuals, Castilleja attenuata and C. tenuis, were both coming into bloom. More puzzling, there was no poison oak—not that we were complaining. Looking at the Oregon Flora Project Atlas, it is not as common this far east as you head north. I wish that was true near me! 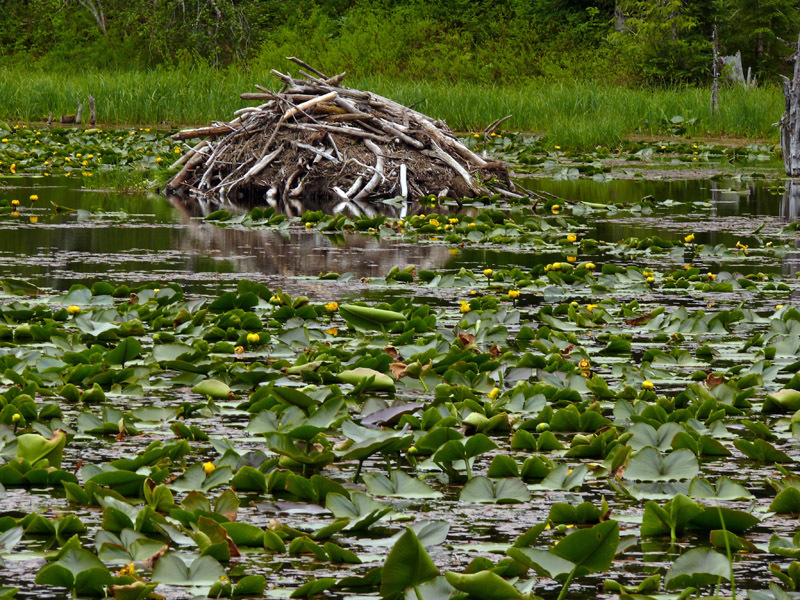 Pond-lilies (Nuphar polysepala) surround the beaver lodge at Wolf Lake. We were tired from all the bushwhacking up and down steep slopes, but I’m always trying to squeeze in a little more while I’m out, so we drove the long way home (more gravel anyway) along Road 15 past Wolf Rock and Wolf Lake. Officially, I think it is called Wolf Meadow, but since there’s barely a foot of dry ground to be found, I’ll keep calling it Wolf Lake. 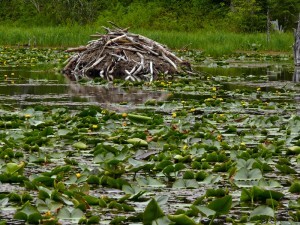 Presumably before the beavers dammed it up, it really was a meadow. It was quite beautiful, all filled with blooming pond-lilies in their prime. I couldn’t help lamenting how dark and cloudy it had become though, as it would have made a much better photo with blue sky above. A number of other aquatics make their home here. Some bog buckbean (Menyanthes trifoliata) was also blooming. Potamogeton natans and the carnivorous bladderwort (Utricularia macrorhiza) were floating in the shallow water. The yellow snapdragon-like flowers of the bladderwort won’t appear for at least a month or two. Wolf Rock is just a short ways from the lake. It is worth driving this way just to see the imposing monolith, apparently the largest in the state. I’ve climbed most of the way up the west side (the east end is sheer cliffs) a couple of times and would love to do it again some day to see the gorgeous show of flowers, but it is extremely steep—much scarier going down than up—and I’m not feeling quite that energetic at the moment.